"Elephant," Violet whispered and looked up at her mother. 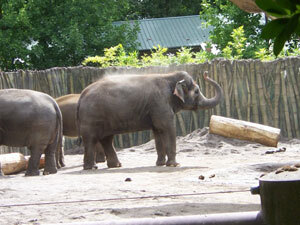 At that moment the elephant, "Tusko" reached down with his trunk and threw dirt on his back creating a big dust cloud. "Elephant dirty!" Violet yelled, giggling. Memories like these are things that you create when visiting the Oregon Zoo. From jungle cats to exotic birds, the Oregon Zoo is a great way to spend an afternoon traveling the globe. Zoo visits don't just have to be summertime affairs, walking the open-aired park in the heat. The Oregon Zoo has something for every season, whether it's spring, fall, winter or summer. Yes, during the summer there are concerts and outdoor events, but some of the best times to visit the Oregon Zoo are during the fall and winter when other events catch the imagination of adults and children alike. Really, is there a better way to visit the African Rainforest display than when it's raining? Of course there are places to eat, a gift shop and the zoo is broken into different parts of the world, with a great Northwest, Pacific shores, Africa and Alaska tundra exhibits to keep you busy. But one thing that captures the imagination of adults and children alike is the Zoo Train. The train operates daily from mid-March to Memorial Day and again after Labor Day to late October. Trains start at 10:30 a.m. and travel the Zoo Loop, a one-mile route around the perimeter of the zoo grounds. During the month of December the Zoo Lights are a great local attraction where visitors ride the Zoo Train and see a light display featuring moving lights arranged like many of the animals. Let the train conductor handle the driving while you snuggle in and see a great display of the holiday lights. The Oregon Zoo has a rich history that started in the 1880s when Richard Knight, a former seaman, became a pharmacist and started collecting animals from his seafaring friends. Due to his love of animals, Knight kept the collect in the back of his Third and Morrison Street drug store. The collection was given over to the city and over the course of its 100+ year history; the zoo has added animals, remodeled and added attractions. You can spend an entire day at the Oregon Zoo and still have things you want to see, so give yourself plenty of time, and dress for the weather. Two new exhibits of the Cascade Canyon are schedule to open next year and will feature cougars and black bears. This new attraction will feature a suspension bridge that leads to an elevated viewpoint overlooking Black Bear Ridge. So whether you are interested in the personal hygiene habits of Asian elephants, or want to see some of the indigenous Northwest wildlife, the Oregon Zoo will educate and spark your imagination. About the Oregon Zoo: Founded in 1887, the award-winning Oregon Zoo is the oldest zoo west of the Mississippi. The zoo's 64 acres are home to animals from all corners of the world, including Asian elephants, Peruvian penguins and Arctic polar bears. From the mist-filled Africa Rain Forest to the majestic new Great Northwest exhibits, the zoo encourages visitors to understand and experience the natural world. Committed to conservation of endangered species and their habitats-both locally and around the globe-the zoo is a center for wildlife preservation and field research. The Oregon Zoo's award-winning education programs serve more than a half-million people both at the zoo and at schools, senior and community centers around the region. A summer concert series, seasonal events and the zoo railway help this popular Oregon attraction draw more than one million visitors each year. The Oregon Zoo is all of this, but it is also a safe place for families to share moments of discovery and fun. Tips: Make sure that you wear comfortable shoes when visiting the Oregon Zoo, and give yourself some extra time. During the summer it can be busy, and make sure you dress for the weather conditions, as it's an open air attraction. Grabbing a map at the entrance is also helpful, as it's easy to get turned around in the 64-acre zoo. If you can, make time to ride the Zoo Train and eat at one of the different restaurants inside the zoo. What to bring: Some of the exhibits are back away from where people are, so make sure that you bring a camera that can handle a little distance. You may also want to bring some binoculars for some of the bigger exhibits - the monkey area is rather large and they can hide in the back of the display. the zoo is open every day except December 25. Getting there: The zoo is located five minutes west of downtown Portland on Highway 26. Watch for the signs. The zoo is the first exit from this highway.